Junichi Yananose is a well-known puzzle designer and crafter who for many years collaborated with Brian Young in Australia. His forte was in creating beautifully complex interlocking burr type puzzles. In 2016 he started his own business, Pluredro, with his wife Yukari, and the puzzle community rejoiced. 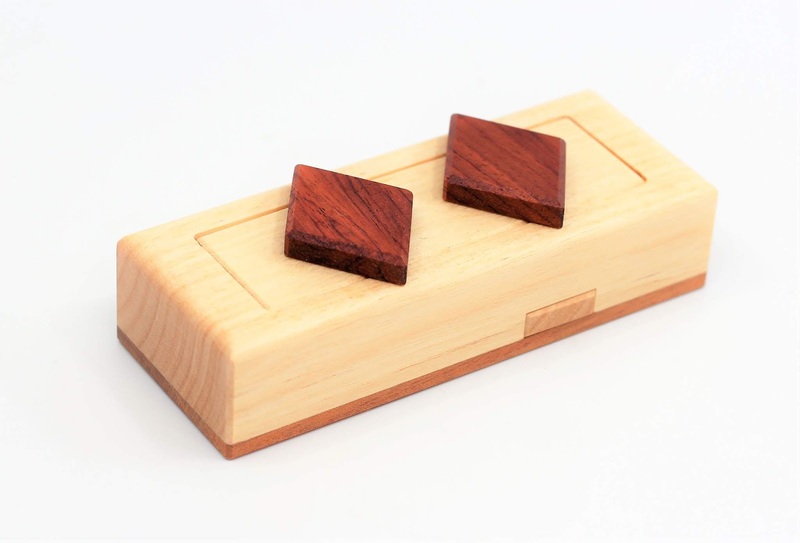 The following year he began to introduce puzzle boxes unlike anything seen before. Naturally his mathematical mind and skill with complex interlocking mechanics lent themselves to some seriously interesting creations. His first box was a very complicated interlocking burr puzzle with a compartment, the Framed Burr Box. The follow up to that was purposefully more understated, a small case with simpler mechanics which everyone could approach comfortably. Simpler does not mean easier though – one must never underestimate Juno. 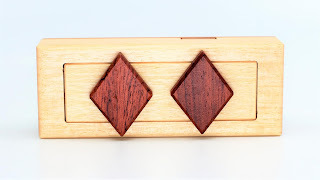 His Diamond Case became the first in a wonderful series of card suit puzzle boxes. 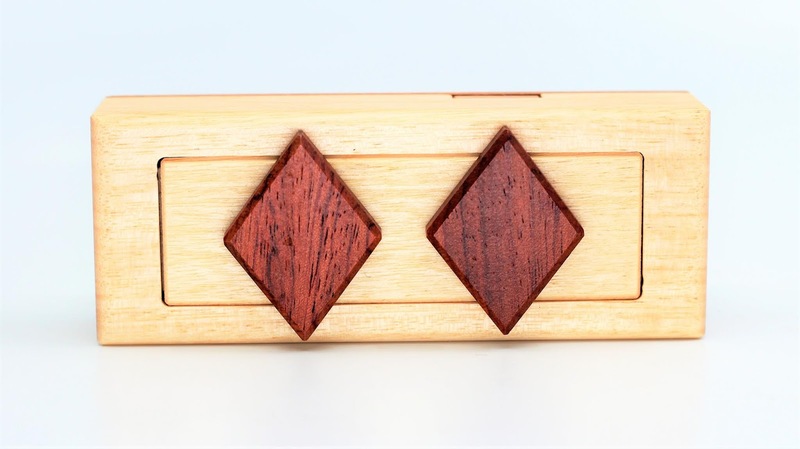 The box is small and comfortable to hold in one hand, featuring two prominent diamonds and crafted from Silver Ash, Bubinga, Queensland Maple, and Jarrah woods native to Australia. Yukari relates that they had a lot of Silver Ash timber stock on hand at the time which was about the right size for the main compartment, so Juno began designing the puzzle based on that element. There is a little notch on one side which plays an important role in opening the box, a fact that becomes obvious the moment you pick up the box. A little exploration reveals what needs to be done, but it takes more than a little to accomplish it. Eventually, you may also come to the realization that there may be more to discover as well, because despite your best efforts, the box remains closed. Juno actually came up with the final “Aha” moment first, and added the initial sequence after, both to make the puzzle more interesting and to distract from the final solution. Diamond Case is a wonderful little box with a few great surprises and sets the stage well for the other boxes in the series. The Diamondback cocktail hearkens back to the era of boozy stirred drinks. 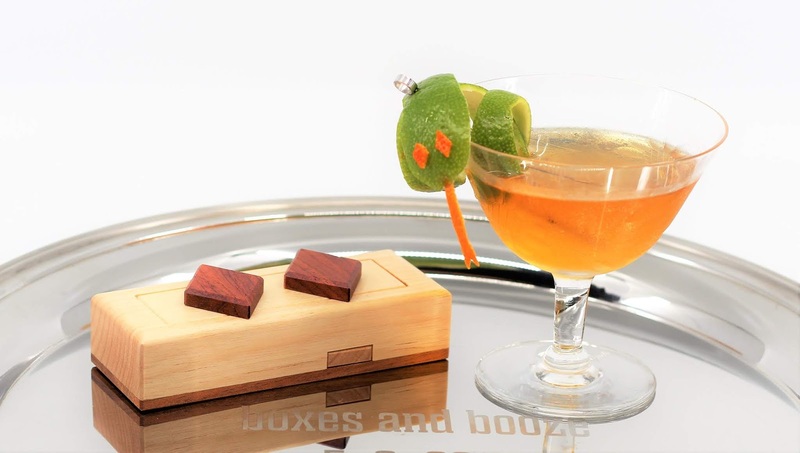 Which doesn’t really mean much anymore, since we are living in the era of boozy stirred drinks once again. 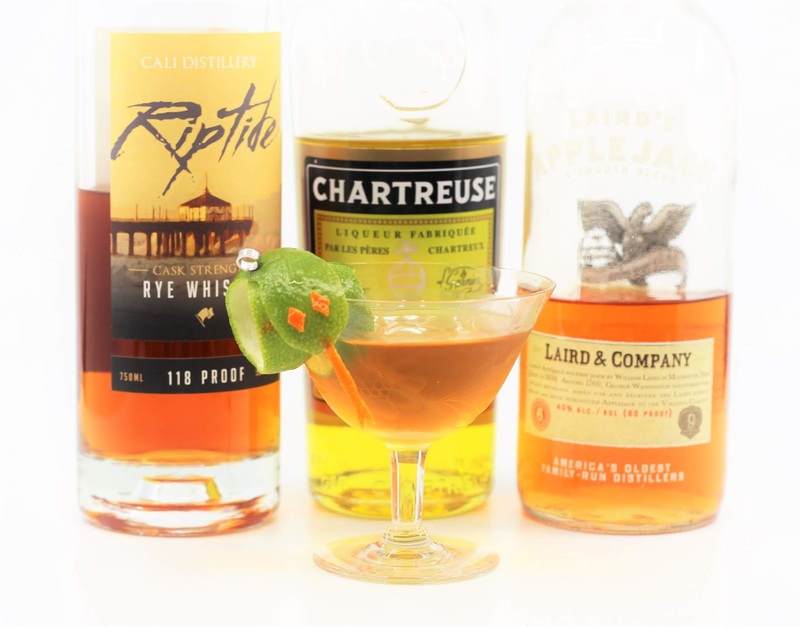 This one, with a hefty dose of rye whiskey, a bit of apple brandy, and the key ingredient, herbal Chartreuse, to round it all out and give it some balance and character, functions as a surprising variation of the Old Fashioned. Chartreuse, it turns out, adds both herbal bitterness and sweetness to a drink, so here it works as both the sugar and the bitters. 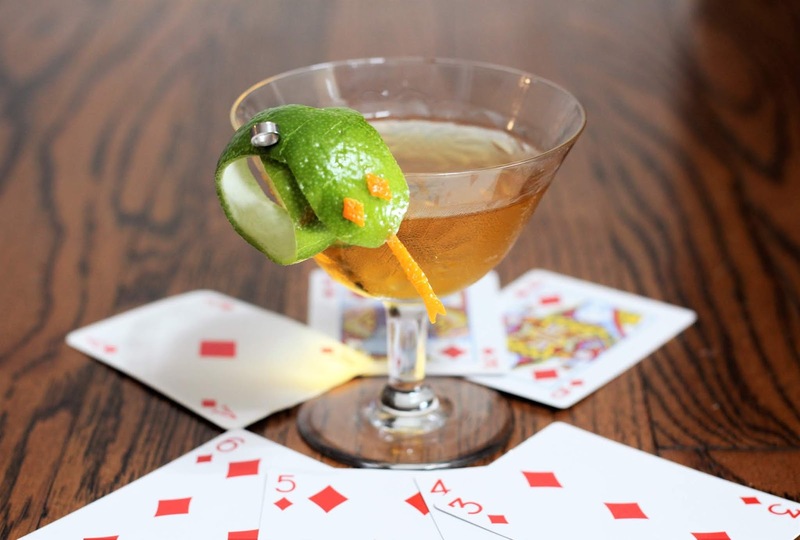 The drink was named after the Diamondback lounge, and was the house cocktail there at the Lord Baltimore Hotel in Maryland, where it was invented by a bartender now lost to the fog of time. The drink makes its print debut in Ted Saucier’s “Bottoms Up”, a racy cocktail book from 1951 with a great title edited by the former publicist for the Waldorf-Astoria. This cocktail has a wonderful comeback story. Bottom’s Up, out of print for decades, was republished in 2011 with reproductions of the original 12 art plates from well-known artists of the day. And the Lord Baltimore Hotel, a historic landmark in the city built in 1928, was purchased by an international hotel group and renovated to new glory in 2013. If you’re in the mood for something truly classic with a bit of panache, this one’s ready for prime time again. Stir with ice and strain into a favorite glass. No garnish necessary unless you’re feeling dangerous. In which case, make a Diamondback snake lime twist. Which, it turns out, is completely misguided. You see, the Diamondback cocktail was not named after the venomous snake, but rather the friendly terrapin, which anyone from Maryland would have known. I am from Texas, by way of New Jersey, and stand corrected. Cheers!